A pitched battle is on over California’s Proposition 29, a measure on the statewide ballot to raise the cigarette tax by one dollar to fund smoking cessation and research on tobacco-related diseases. If enacted, the measure would increase California’s per-pack cigarette tax to $1.87 per pack. According to Maplight, the biggest donors favoring the tax are the American Cancer Society ($7.42 million), the Lance Armstrong Foundation ($1.5 million), the American Heart Association ($546,256), the American Lung Association ($412,086) and Michael R. Bloomberg ($500,000). Laurene Powell Jobs, the widow of Steve Jobs, kicked in $25,000 to support Prop. 29. But those amounts pale in comparison to the tidal wave of money tobacco companies and their allies are pouring into defeating the measure. 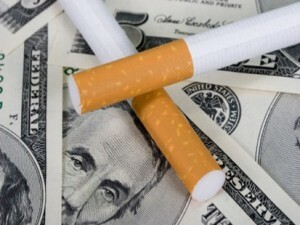 Philip Morris (Altria) alone has given just over $24 million, Reynolds American, Inc. has put in $9.57 million, and U.S. Smokeless (also owned by Altria) has put in $1.5 million. The California Republican Party contributed $1.14 million to defeat the tax. As usual, tobacco companies are trying to hide their role in the campaign by refusing to speak to journalists, running ads without their fingerprints on them and fighting the campaign through a front group, “Californians Against Out-of-Control Taxes and Spending,” which is aligned with right wing, pro-business groups funded by millionaires and billionaires like Americans for Prosperity, FreedomWorks, the Chamber of Commerce and the Petroleum Marketers Association. Californians Against Out-of-Control Taxes and Spending doesn’t even list tobacco companies among the “No” campaign’s endorsers on the group’s website — as if tobacco companies weren’t involved. Big Tobacco is especially worried about Prop. 29 because California has led the nation for two decades now in enacting policies that really do reduce smoking. California eliminated smoking in all workplaces, including restaurants and bars, in 1998 — a policy largely thought to be a impossible holy grail for decades. To defeat the smoking ban, the tobacco industry worked to whip up social fears about the loss of personal freedom and spreading unfounded fears of economic doom. Once the law was in place, though, people loved the smoke-free bars, restaurants and casinos and the predicted catastrophic losses in income never happened. The unabashed success of California’s 1998 smoke-free law produced a groundswell of public demand for similar measures throughout the country — something the industry no doubt fears could happen once again with Proposition 29, especially now, when state governments are so strapped for cash.